Obama Was Prepared to Lose in Iraq…. LIEBERMAN: Look, the fact is that if Barack Obama’s policy on Iraq had been implemented, Barack Obama couldn’t go to Iraq today. It wouldn’t be safe. Barack Obama and John McCain saw the same difficulty in Iraq. John McCain had the guts to argue against public opinion, to put his whole campaign on the line, because, as he says, he’d rather lose an election than lose in a war that he thinks is this important to the United States. The reason I say Barack — if Barack Obama’s policy couldn’t — had been implemented — if Barack Obama’s policy in Iraq had been implemented, he couldn’t be in Iraq today is because he was prepared to accept retreat and defeat. And that would mean today Al Qaida would be in charge of parts of Iraq. Iranian-backed extremists would be in charge of other parts of Iraq. There’d be civil war and maybe even genocide. And the fact is that we are winning in Iraq today. And you know, you can’t choose, as Senator Obama seems to think, to lose in Iraq so you can win in Afghanistan. The reality is if we lost in Iraq, which Obama was prepared to do, we would go to Afghanistan as losers. Instead, Al Qaida has its tail tucked between its legs as it’s exiting Iraq to go…. WALLACE: …. I want to move on to the whole issue of his (Obama’s) trip this week. Senator Lieberman, the McCain camp seems divided about whether this is a legitimate fact-finding trip or a political stunt. After McCain and the Republican Party taunted Obama for not going to Iraq, has that, in fact, backfired on them by making this an even bigger story? 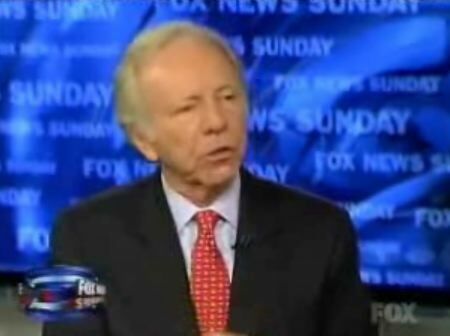 LIEBERMAN: No, I don’t think so. I think John McCain’s challenge to Barack Obama is very important. And frankly, it says a lot more than whether McCain was right about Iraq and Obama was wrong. It says what kind of leaders these people will be as president. Obama reached — John McCain reached a decision about what to do in Iraq based on what he saw there, what he heard — what he heard from the generals and from the soldiers, and then he had the guts to fight big interests to see – – including public opinion, to see that that would happen. Vets for Freedom: Finish the Job…. This is the new ad from Vets for Freedom. This is going out nationwide. You can help defray the cost here. Treachery 5, Rule of Law 4: Defeat for the Nation…. I am publishing the entire Levin piece below; it is deserving of a wide audience. It has been the objective of the left-wing bar to fight aspects of this war in our courtrooms, where it knew it would have a decent chance at victory. So complete is the Court’s disregard for the Constitution and even its own precedent now that anything is possible. And what was once considered inconceivable is now compelled by the Constitution, or so five justices have ruled. I fear for my country. I really do. And AP, among others, reports this story as a defeat for “the Bush administration.” Really? I see it as a defeat for the nation. UPDATE: The 5-4 GITMO decision brings to the front, yet again, John McCain’s position on judges versus his own policies. McCain undoubtedly supports the 5-4 decision, yet the justices who voted against it, and argued strenuously against it, are of the kind McCain claims to want on the bench. We have seen the same issue arise respecting campaign finance. This is not to say that McCain won’t nominate originalists to the bench. But if he does, he will be nominating to the Court individuals who are better adherents to the Constitution than he is. Meanwhile, the always predictable Bush hating New York Slimes editorializes today with the heading: Justice 5, Brutality 4! Surge Working, What Say You Now, Bammy? ….Iraq passed a turning point last fall when the U.S. counterinsurgency campaign launched in early 2007 produced a dramatic drop in violence and quelled the incipient sectarian war between Sunnis and Shiites. Now, another tipping point may be near, one that sees the Iraqi government and army restoring order in almost all of the country, dispersing both rival militias and the Iranian-trained “special groups” that have used them as cover to wage war against Americans….the rapidly improving conditions should allow U.S. commanders to make some welcome adjustments — and it ought to mandate an already-overdue rethinking by the “this-war-is-lost” caucus in Washington, including Sen. Barack Obama. * They travel miles in the heat. * They risk their lives crossing a border. * They don’t get paid enough wages. * They do jobs that others won’t do or are afraid to do. * They live in crowded conditions among a people who speak a different language. * They rarely see their families, and they face adversity all day every day. Doesn’t it seem strange that many Democrats and Republicans are willing to lavish all kinds of social benefits on illegals, but don’t support our troops and are now threatening to de-fund them? From an email making the rounds; appropriate for Veterans Day. NORWICH, Conn. (AP) _ Two Connecticut veterans have been presented with Purple Heart medals for injuries they received while serving in the Vietnam War. U.S. Congressman Joe Courtney presented the awards at the Norwich Veterans of Foreign Wars post today (SATURDAY), calling the honors long overdue. One of the veterans, Montville resident John Gleason, was injured during a nighttime attack in which he was temporarily blinded by shrapnel that struck his face. The other veteran, David Salemma of Baltic, was injured when a booby-trapped explosive went off near him as he and a comrade worked to plan a nighttime ambush on the enemy. The presentation of the awards are among many events and ceremonies planned throughout Connecticut over the next few days in honor of Veterans Day. Lets say “THANKS” To Our Military Men and Women! Select a free card here. Parade 2007 – Hartford, CT’s 2007 Veterans Day Parade is orchestrated by the Greater Hartford Arts Council. Each year their work brings the response of attendees and participants from across Connecticut and throughout Massachusetts. An estimated 25,000 – 40, 000 viewers line the parade route and this year will be entertained and have their spirit of national pride lifted by some 40 Veterans groups, 25 marching bands, and 96 marching units made up of 3,5000 people from almost 50 Connecticut towns and cities. The Veterans Day Parade this year will be held a full week ahead of the official National Veterans Day . The Veterans’ Day Parade in Hartford, CT, 2007 will beheld on Sunday, November 4 beginning at 1 p.m. in the downtown area. This year’s parade will feature government figures like Hartford Mayor Perez , small units from the CT. Sons of the American Revolution and more sizable marching bands from the University of Connecticut and University of New Haven Marching Band and Color Guard. Drum and Fife and Pipe and Drum divisions will add variety to the musical offerings. Civic and business representatives will also provide some local interest and color . Special Features. In addition to the large number of marching units and participants the Veterans’ Day Parade in Hartford, CT 2007 offers several special features . The crowd will have the opportunity to view parade participants who are also inductees into the CT Veterans’ Hall of Fame. Those attending will find the parade all the more memorable for as everyone comes to attention for a shared moment of silence, the tolling of the Center Church Bell, the singing of the national anthem and a climactic A-10 flyover. The Veterans’ Day Parade in Hartford, CT in 2007 may well resemble other parades of other years, but this year there are a number of Connecticut units home from overseas duty in Afghanistan and Iraq. The opportunity to honor those newest veterans is likely to be sufficient to swell the customarily large crowds and to raise everyone’s consciousness of how much we truly owe to those who take up the uniform and the flag in the name of peace and democracy. Pic: 2006 parade with Governor’s Horse Guards in the vanguard. In the largest charity auction ever on Ebay, the “Limbaugh smear” letter signed by Harry Reid and 41 other senators is now at $2,100,100.00 with 3 hours to go. All proceeds go to the Marine Corps Law Enforcement Foundation, and Rush Limbaugh has pledged to match the hammer price. Since 1995, the Marine Corps-Law Enforcement Foundation has distributed scholarship assistance valued over $25,000,000.00.